Pilar de la Horadada This area is classed as southern Costa Blanca, just in Valencia, but is only 1 1/2 miles from the border of Murcia, hence very near to the Mar Menor inland sea, La Manga and Murcia airport. In a quiet, peaceful location, the houses are ideal for families and feature great sea views from the private balconies. Each of the houses has 2 floors with a lounge/dining room, a washroom, a fully-equipped kitchen and a terrace on the ground floor and 2 double bedrooms with an extra bed, a bathroom and a balcony on the top floor. With all the freedom, independence and convenience of a house you can explore the surrounding region at your leisure. Experience the area’s great water sports or horse riding or play a round of golf on one of the region’s excellent courses. Keys must be collected from reception at the Palmera Beach Apartments, on Avenida da Francia s/n), Urbanisation Mil Palmeras. 4-room terraced house 80 m2 on 2 levels, comfortable furnishings: living/dining room 20 m2 with satellite-TV and electric heater. Shower/WC. Boiler (50 litres). Upper floor: 1 room with 1 french bed (150 cm, length 195 cm). 1 room with 2 beds (80 cm). Shower/bidet/WC. Terrace. Terrace furniture. View of the swimming pool and the garden. Facilities: washing machine. Glazed terrace with sofa bed on the upper floor without blinds. Urb. Rio Mar 3 km from Pilar. : Nice, cosy terraced house “Magdalenka”. 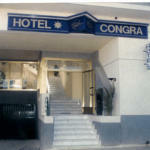 15 km from the centre of Torrevieja, in a quiet position, 800 m from the sea. For shared use: grounds with lawn and plants, swimming pool (01.01.-31.12. pool opening hours: 08:00-15:00 and 17:00-23:00). Paddling pool. Private: patio. Grocers 1 km, supermarket 1 km, restaurant, bar 500 m, sandy beach 800 m. Golf course 7 km, tennis 100 m. Please note: car essential. Holiday home Pilar 25 Spain is located in Pilar. The accommodation will provide you with a TV and air conditioning. More from Rental Spain information Holiday Villas. here is a full a kitchenette with a microwave and a refrigerator. Private bathrooms also come with a shower. You can enjoy sea view from all the rooms. This holiday home is 48 km from Alicante Airport. The hotel is equipped for you and your family, to have an enjoyable and relaxing stay. The charming town has a relaxed and friendly ambience. There are a few of places of interest to visit such as, the Roman watchtower and the parish church, Nuestra Señora del Pilar. Pilar has a 4 kilometres of beach, where the Mar Menor laps the shore. The calm waters make it an ideal place to take part in water sports. The hotel is just a short drive away from the coastline that offers sandy golden beaches, as well as rocky shores that hide many coves, waiting to be discovered. Pilar, is a small but lively town. Here you will find plenty of shops, restaurants, bars and a few supermarkets. Pilar also has a couple of outdoor markets during the week. Get the highest quality from mag Flags » Do not accept cheap imitation! Pilar de la Horadada Holidays Costa Blanca. Pilar de la Horadada, is a small but lively town. Here you will find plenty of shops, restaurants, bars and a few supermarkets. The area is classed as southern Costa Blanca, just in Valencia, but is only 1 1/2 miles from the border of Murcia, hence very near to the Mar Menor inland sea, La Manga and Murcia airport. Pilar also has a couple of outdoor markets during the week, a museum, gym, music conservatoire and a cinema. The cinema shows the latest films in English on Saturday and Sunday evenings. There is also a fantastic municipal sports centre with tennis courts, football pitches and a large swimming pool which has a retractable transparent roof that slides open in the summer. There is a lovely unspoilt promenade and Pilar de la Horadada, features more than four kilometres of high-quality beaches. Within a 15 min drive there are at least 3 golf-courses. There is a host of other activities in the area…bicycle hire, walking, watersports, fishing and places of interest to visit etc. Spain Info, Pilar de la Horadada.